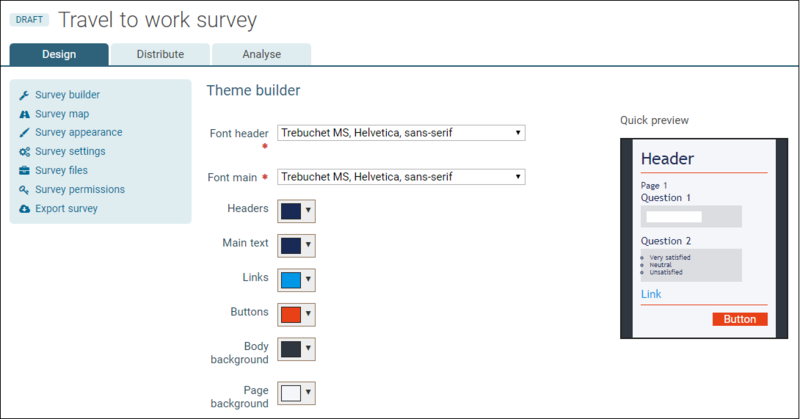 Online Surveys comes with a set of standard themes to choose from, but you can create your own using the Theme builder. 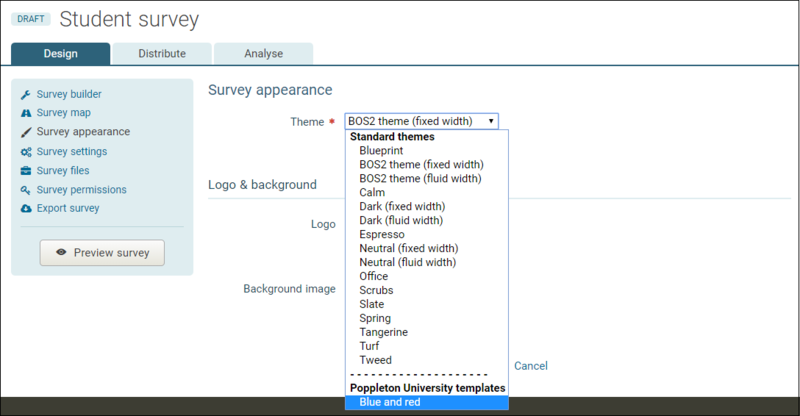 To use the Theme builder, go to the Design tab of your survey and click on Survey appearance in the left-hand menu. To create a new theme, click the Create new theme button. Creating a new theme is simple. Just use the drop-down lists and colour pickers to change the attributes of the default survey theme. The diagram on the right will update as you go to show you how your survey will look. Once you are happy with your design, give your theme a memorable name and make sure you press the save button. 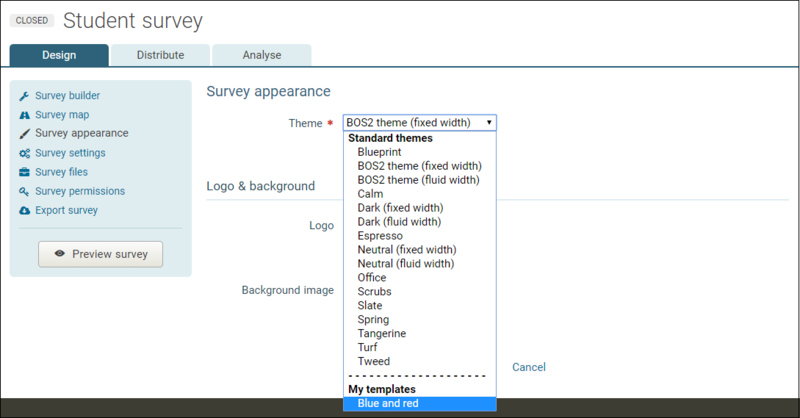 You can make your new theme available as a template for all your other surveys. In the Theme builder, just check the box next to Make available as a template on all my surveys. Your shared theme will then appear as an option in the theme selector in all your surveys under My templates. An admin user in an Organisation account can make a theme available as a template for all users in the account. In the Theme builder, just check the box next to Make available as a template on all surveys on [Account name]’s account. Your shared theme will then appear as an option in the theme selector in all account surveys under [Account name] templates. Make sure you think about the name you give the theme before making it available to other users. It should be descriptive and memorable. If you are creating a theme to be used for all users in the account, consider creating and keeping a survey especially for managing that theme template. Name the survey after the theme so you can easily find it. When a shared theme is used on a second survey, a copy is created. Editing a shared theme will only update the appearance of the survey it is being edited on. A theme shared with an account cannot have the same name as any other themes shared with the account. To delete a theme, choose Edit [theme name] on the Survey appearance page of the survey it was created on. Press the Delete button at the bottom of the Theme builder page. Deleting a theme does not delete copies of it where it is used on other surveys.